At the CWPPRA meeting this past month, Task Force members voted on important wetland projects in order to protect new orleans from surge. 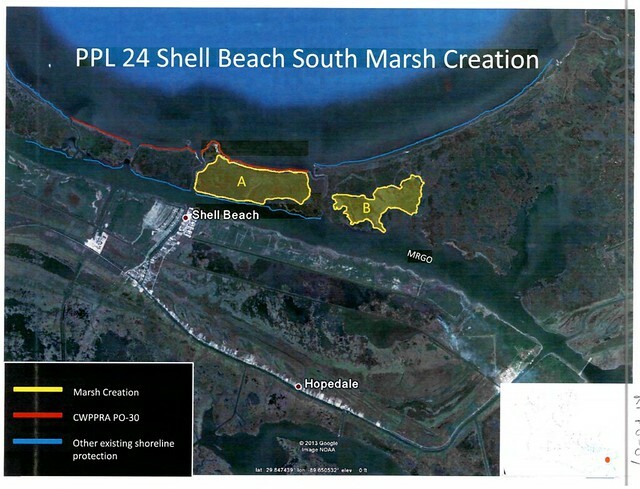 the Shell Beach Marsh Restoration project and the Orleans Landbridge projects are in the footprint of the State's Master Plan and the Army Corps' MRGO restoration. Unfortunately, the funding for such essential flood protection for New Orleans has not been forthcoming from either the Corps or the State. For 24 years, CWPPRA has led the way in developing the science, engineering, the monitoring, and the implementation process for the wetland restoration program. There is much to be learned from the successes and the failures of the program. These two projects, though they are small, are in critical landform areas in the Pontchartrain Basin. They will build essential wetlands that knock down storm surge and provide fish and wildlife habitat. They are part of several regional plans to restore such features, and have a 20-year project life and monitoring plan. These are all features of restoration projects that GRN seeks for RESTORE Council projects. Although many of these "pot 2" projects from RESTORE are very worthy, many only describe for 3 years of monitoring. CWPPRA projects all have a 20 year project life, and are monitored at 5-year and 20-year intervals. This monitoring is essential, so that federal trustees can fix the project if it is underperforming. Monitoring is the only way that the public knows that the government is keeping its promise to the environment, and their promises to the public. RESTORE Council needs to live up to this promise.